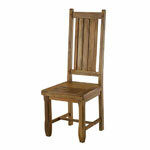 Need a matching set of dining chairs, or just an extra one or two? Our collection of dining chairs includes a great choice of wood frames, in a range of tones or finished with beautiful fabrics. Take a look.